(Oceanside, Oregon) – The sheer wonders (and the terrifying truth) of how the Oregon coast came to look as it does are on display at Cape Meares, just west of Tillamook. 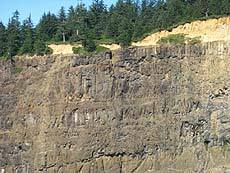 This dramatic set of cliffs is a few miles north of the village of Tillamook, and just a tad bit south of the Bayocean Spit - which itself boasts a weird history of having once been a major resort town, but is now only a stretch of sandy dunes. 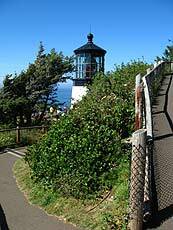 Cape Meares has a bundle of attractions all its own: the wacky, candelabra-shaped “Octopus Tree,” a major haven for watching birds or storms, a prime place for spotting whales, and a lighthouse. But its soaring, black cliffs are also a catalog of freaky, geologic activity that goes back some 15 million years, and tells some scary tales that make the upcoming flood of Halloween-induced ghost stories look like early Disney flicks. Looking at the massive cliff walls and their ragged features from the various viewpoints along Cape Meares is, understandably, one of the big pastimes at this amazing spot on the north Oregon coast. But if you know how to read it, a wild saga emerges. They are, in many ways, a slice of the Earth’s crust in this area, cut down the middle so we can – quite literally – see the layers. Tom Horning is a Seaside resident and renowned geologist on the subject of anything coastal.. He’s spent considerable time gazing at the myriad of layers embedded in the rocks here, frozen in time from the Miocene period. He says these layers represent eons of massive lava flows that have piled on each other over millions of years, coming here from hundreds of miles away. You can see the lines along the cliffs here, which show one lava flow upon another, until you get to the topsoil, which is its own story. He says it all begins with a fiery situation over 15 million years ago, when a giant hole in the Earth’s crust spewed so much lava it scarred and seared its way across what was then Idaho and Eastern Oregon, until it reached the sea (which was several miles inland, perhaps as much as 75 miles east). 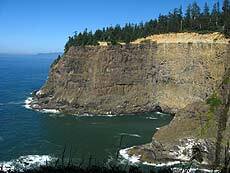 “Cape Meares is a lava delta where Columbia River Basalt Flows filled a canyon that had been eroded into the coastal hills,” Horning said. This wouldn’t have happened in the quite the same way, if it wasn’t for the coast range being so diminutive at the time. The lava intrusion followed the path of an ancient river, over the still small coast range. At that point, Horning said the river path the lava followed was that of the Trask-Tualatin, which possibly extended into the Cascades as the Clackamas River. Essentially, these massive flows came again and again, separated by hundreds, thousands maybe even millions of years. No one is really certain how long between each eruption. The lava flows literally filled up the space in a prehistoric valley, locking its shape in time with the sturdy basalt rock that happens after lava cools. Eventually, that valley eroded away, leaving only the rock. Some time after the last eruption, the massive rock structure sank into the Earth and popped up again, several times over the millennia as the land rose and fell. Sometimes, depending what the ocean was up to that particular epoch, it sank into the sea, occasionally becoming the sea floor. 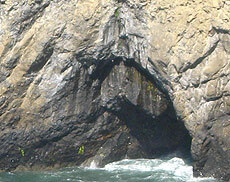 If you look at the bottom of the cliffs, you some different formations, rather than the jagged, undulating lines of various lava flows you see throughout most of the cliffs. This is the beginning of the flows. 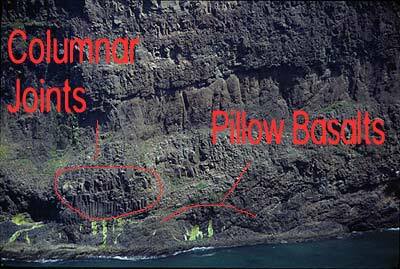 Horning refers to the various layers as units, and notes the presence of pillow basalts at the bottom of the cliffs. These kind of basalts are puffy and rounded, happening when lava hits the water and cools abruptly. This cooling in the air action sometimes created strange shapes, which can also be seen at the bottom of the cliffs: little bundles of what look like columns dotting throughout one layer. This is when the lava cooled from the inside upward, and the cooled sections of lava separated into these upward-pointing shafts. Hence the different and odd shapes you see in this cross section of geologic wonders. Horning said there is lots to be discovered still about all this process and about how this area looked over those millions of years. Unfortunately, so much is gone. “Its connection to the Willamette Valley has been eroded away,” Horning said. “The trick to seeing the river channel coming through the coast range is to connect the sources of the Trask and Tualatin Rivers. 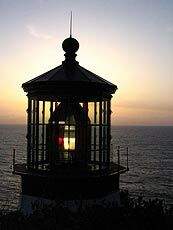 They meet at the summit of the coast range." Finally, the sandstone layer at the top of this delightful cross section has some connections to areas on the central coast. The origin of this top layer is quite a ways east, Horning said, carried down to the ocean via the prehistoric Columbia from Idaho and Washington, during the Miocene age. 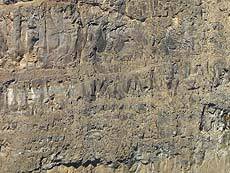 The Whale Cove sandstone is from the same period. It’s all a part of a bigger, weirder picture that helped form what we all see on the coastline. 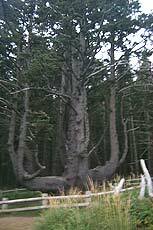 The origin of Oregon’s most stunning tourism attraction is really quite a frightening tale.